Prominent & Leading Manufacturer from Indore, we offer high chrome grinding media ball and hyper steel grinding media balls. Vinayakashot Private Limited is manufacturer of High Chrome Grinding Media Ball in good Quality and high durable grinding media through alloying process and supplying to our clients. Known for its rigid and tough structure, they are highly demanded by our clients throughout the domestic market and export Market. We are manufacturing these balls in various dimensions so as to meet the changing and diverse requirements of our clients. Our valuable customers can avail them from us at highly economic prices. 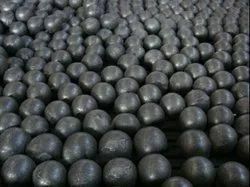 Furthermore, forged & cast grinding media balls have low rate of breakage with high ratio of alloy elements with high impact toughness leading to long lasting life. Vinayakashot Private Limited is manufacturer Hyper Steel Grinding Media Balls,can be balls or peculiar shapes which are used for polishing the rough surfaces of many different metal components. The different shapes are designed to get into the varying crevices and contours of diverse metal products.Types of Grinding Media are AS: Balls , Balls Cones , Barrels , Ovals , Diagonals, Pins , Flat Pins Etc.